This is the story of how I ended up with a mountain bike and converted it to a touring bike. Aside from being a little small for me, the woman's frame lacks a top tube. I have gotten over the embarrassment of riding a women's bike, but the practical issues remain. The number one annoyance is that the bike cannot lean against your legs very well when standing. Once let go of the handlebar it just wants to fall over, on top of you, and even more so when loaded with gear. Aside from that you can feel the frame flex in when cornering because a frame without a top tube is usually not very stiff. The lack of braze ons for mounting luggage in the front means everything has to be packed on the back, which will sometimes lift up the front wheel while riding. No place to keep water bottles means you have to stop to drink, while you have to be careful that your bike doesn't fall over because of the aforementioned problem. The bike saddle is a strange thing. With a soft seat you can have a perfectly comfortable ride for an hour or even longer, but then it can suddenly turn in to a torture device that can ruin your day. I deal with this by mounting the harder seat from my folding bike on my city bike during the summer, but it is far from a practical solution. Another great annoyance is the fact that the city bikes are not built to be repaired and maintained on the road. On longer bike rides I would worry a lot about getting a flat tire. Something as simple as replacing an inner tire required a ridiculous amount of specialized tools, including something called a fork spreader. If everything went well I could get the whole operation done within an hour, which included adjusting the roller brakes, every time. And then there were the cycling shoes with SPD-cleats laying unused in the closet. I had purchased them for that time years ago when I participated in a race, but don't have a bike with pedals to use them on anymore. Something that does not fall over between my legs, where my knees don't touch the handlebar when going around the corner and I can mount racks, mudguards an bottles on. After spending some time adjusting and cleaning derailleurs I really wanted an internal gear hub. Derailleurs are the most common for shifting gears, and that is what professional cyclists use. However, beside needing more maintenance I have also seen quite some derailleurs get bent or broken, usually during transport or a minor accident. That is a potential problem since the intended use for this bicycle is to be regularly transported in trains, buses and possibly airplanes. The big trade-off with internal gear hubs, is that they add weight, but I think I can live with that. The second concern is they are so mechanically complex that they cannot easily be serviced on the road. But after using various internal gear hubs for over 10 years I never had an issue with it that would leave me stranded. the worst I have had was not shift properly into a certain gear, or make some weird sounds after many years of use and no maintenance at all. 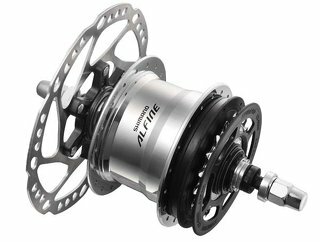 Shimano Alfine Inter 11 internal gear hub with disc brake rotor. Pretty much everyone agrees that the Rohlhof Speedhub with 14 gears is the best one you can get. Priced at 900 euro is is quite expensive, but it will last a lifetime. I would gladly pay the money if I was assured that 20 years from now I would still be using it. Unfortunately we have to face the fact that bicycles do get stolen, making it more expensive not just makes it a greater potential loss, but also a more appealing target. Eventually I settled for the next best thing, the Shimano Alfine Inter 11. It's only been on the market a few years, I read about some people having problems with it, but overall it has proven itself to be reliable. Maintenance is just as simple as with the Rohlhoff, just replace the oil once every 2 years with a syringe. No need to take the whole thing apart. The range is a bit more limited (409% versus 526%), but at less than half the price it seems to be better value for the money, if it turns out to be reliable. At first I thought some simple rim brakes would suffice, and the general agreement is that V-brakes are quite good. However my experiences with maintaining V-brakes on my girlfriend's bicycle are quite bad. The bolts got stuck, I broke off a mount trying to loosen it, the springs don't spring and I broke off a bit in an adjustment screw which was then rounded out and was stuck forever. Aside from that the whole thing is always dirty with rubber, sand and grease, replacing the brake pads is finicky. You need to keep cleaning the rims, which will eventually wear out requiring you to rebuild the wheel and it doesn't even brake that well in the rain. After some research it became clear to me that disc brakes are the way of the future. They allow for more controlled stops, are less messy and don't wear out the rim, yet you can still remove the wheel relatively easy. Most disc brakes are hydraulic, some are mechanic. Hydraulic ones can leak and require special tools. Most mechanical ones are not very good, but there are a few good ones. As I want to be able to maintain the bicycle myself, even on the road I prefer a good mechanical disc brake. For some people the wheel size is really important. In the Netherlands just about every adult sized bicycle has 28" wheels, but getting any other size of replacement tire or tube is easy enough. Some people argue that 26" is a better size for touring bikes as it is the most used size in the world, and it is easier to get the wheel or tire replaced. I think that is a bit of overthinking it, there are far worse things that could happen. It is not that hard to carry a spare tube and foldable tire with you. You can also have one mailed to you. If you are so unlucky enough that the whole wheel is destroyed (and nothing else) there are still plenty of other things you could try. Besides, a 26" wheel will still turn in a fork made for 28" wheels, but not the other way around. With the gearing and braking decided it was time to find a frame. Finding the right frame proved to be the most difficult step in the whole process. An internal gear hub works best with horizontal rear fork ends, for easy chain tensioning. The vast majority of bicycle frames have vertical dropouts for derailleurs. Disc brakes require special mounts on the frame that even fewer frames have. And since this is supposed to be a touring bicycle it should also have mounts for bottles, racks, and preferably mudguards. Bicycles specifically made for touring seem to be more expensive that other bicycles with similar components. The only possible explanation is that the market is just smaller and customers are willing to spend more money on this kind of bicycle. Because a touring frame seems to much more expensive than another bicycle made from the similar quality materials/tubing. With the main difference is the geometry and and the amount of braze ons. Eventually a friend pointed me towards Genesis Bikes UK who had an odd mountain bike that fit my requirements. At first I was not really enthusiastic about the geometry, a mountain bike was not really what I was looking for. Unlike most mountain bikes it had lots of mounts for fenders, racks and bottles, a steel frame horizontal rear fork ends for an internal gear hub with a rigid front fork and fits large 28" wheels (they call it 29" for mountain bikes which have bigger tires). A real touring bike has longer chain stays so that there is more heel clearance when loading gear on the back. The longer wheel base also makes the bike more stable. However, my intended use is not to go around the world, I will be regularly taking the bicycle in the train and bus, where a slightly shorter bicycle is not a bad thing. 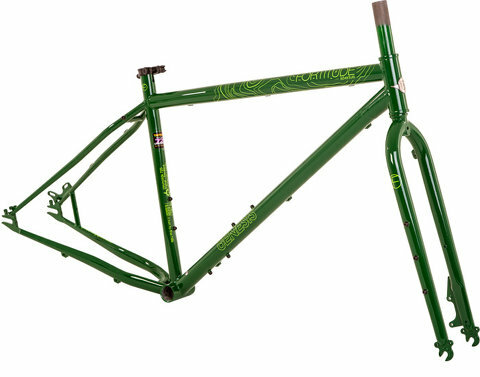 Genesis Fortitude Adventure steel alloy frame made out of Reynolds 725 tubing with horizontal rear fork end, disc brake mounts, mudguard, rack and bottle mounts. The same thing counts for the stiffness of the frame. A mountain bike has a slightly lower top tube so that it easier to stand over it, the downside of this lower frame is less stiffness which will be noticeable when having loaded it both front and back. After riding a woman's frame for some years I am well accustomed to the feeling of the frame twisting while cornering, but it really is not that much of a problem. The mountain bike frame is much better than what I had before. After some careful consideration I came to the conclusion that this frame was the closest thing to what I wanted and that I would probably not find anything better. Originally I intended to buy the frame, and add all the components myself. After assembling a shopping list for all the parts it turned out that the bike designers already had made pretty good selection, and that the price of buying everything separate was a little more than the bicycle itself. I was willing to pay that price for the joy of building a bicycle myself. Some people like to build non-functional models, but building a real thing is even more fun. The plan was to build the bicycle over the winter and be ready for the spring. Most bicycle manufacturers announce their products for next year in the fall. While I was waiting to see if some other suitable frames would appear on the market last year's models went on discount. Browsing around on the internet I stumbled across the bicycle, fully assembled discounted by 46 percent. For that price I could just strip of the parts I don't want, throw them in the trash, replace them and still be cheaper than building the bike myself. Since that would be quite wasteful I opted to sell the parts I didn't want instead. After receiving the bicycle I got another one for my girlfriend who also needed a bicycle to go on touring trips with me. Having one with similar components would make the maintenance easier, and with this big of a discount it was a really good deal. Later it turned out that this incredible discount was also because the model was being discontinued. The weird mountain bike only seems to appeal to a very select group of people.